We have created this informational website for people to discover, learn about, and discuss Clean Eating, wellness, nutrition, & fitness. We want to get the word out about how to Eat Clean and how it can change your life for the better. It can help you to feel so much healthier and so much more energetic than you ever have. Here you will find Clean Eating and healthy lifestyle related articles, opinions, reviews, and recipes. 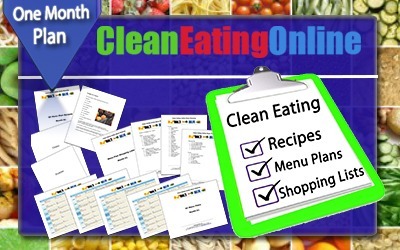 Additionally we offer Clean Eating Menu planning to help you navigate your path to Clean Eating. You may sign up for our Clean Eating Online Newsletter in the boxes to the right. If you are a Menu Planning Member you will already receive our “Members Only” Newsletter. Thanks for stopping by and be sure to check out Clean Eating discussions on our Facebook page @ http://www.facebook.com/cleaneating. My name is Jennifer Gray. I’m a 46 year old stay-at-home mom with 2 children. My son Alex is 8 years old and my other son, Cameron, is 6. I started this website because I want to get the word out about how to eat clean and how it can change your life for the better. I feel so much healthier and so much more energetic than I ever have. I discovered clean eating about 5 years ago. After having two children by c – section in my late 30’s let’s just say my body was not exactly where I wanted it to be. I had been working out for about 9 months but I just couldn’t seem to drop much weight. I chalked it up to the fact that I was older and my body just was never going to look the way it did when I was younger. But it was so frustrating working out as hard as I was (6 days a week, 45 mins to an hour) and not seeing much weight coming off. So I started doing some research and discovered the world of eating clean. To simplify it, eating clean just means eating no processed foods, no alcohol, no sugar, no chemicals. Once I began eating this way and continuing to exercise, the pounds started melting off. It was slow (about 1-2 lbs. a week) but over a 6 month period I lost 25 lbs. So not only do I look better, but I feel much better. I have more energy and my skin looks better than it ever has. Eating Clean has become a way of life for me. No more counting calories, fat grams, or carbs. I just eat healthy real food. What’s really great about it is I don’t have to think about every little bite I consume. I simply eat the right things and that’s it. I hope this website inspires you to try clean eating for yourself. To help people start eating clean we have created monthly meal plans for you and your family that are healthy AND delicious. All of these menus come with clean eating recipes that everyone will love! We even include weekly shopping lists to make grocery shopping super easy! All will be sent by email immediately after your payment is processed. NEW clean eating recipes before they are posted on our website! The foundation of our Clean Eating meal plans are clean, unprocessed, whole foods. Nutritional information is provided to make it easy to track fat, calorie, protein and carbohydrate intake Another benefit of the meal plans is that they are so versatile! If you discover certain recipes that really appeal to you, you can simply repeat them as often as you wish. If you prefer a lot of variety, then stick to the meal plan as is. Imagine having an entire month’s worth of meals right at your fingertips! No more having to answer that dreaded question, “What’s for dinner?” We’ve done all the work for you.